For Jackson Family Wines and the Willakenzie Video, as with all my clients, we want to find the best and most streamlined process for sourcing quality tracks for your the sales video & audiocast. I routinely use Musicbed.com because it meets a high quality standard, at reasonable rates. I share this information here so that you can understand the factors that impact licensing fees for music. This site is one of many, but the prices don't vary much. between the competitors. However, the quality does. If you want good music, it ends up costing. Musicbed is an economical option with great options, without having to source from popular music, or going with stock tracks. I wanted to outline the process below so you could help accurately represent the company and the project requirements, so I can in turn accurately estimate the cost of music for this video. You can click this link to follow along and try different licensing options to help refine the selection: https://www.musicbed.com/songs. Simply click on "LICENSE" to start the process explained below. 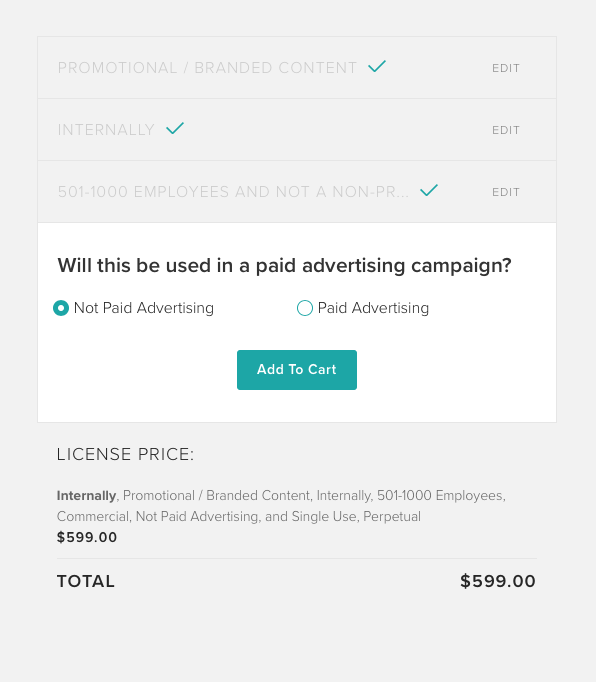 At musicbed, they ask some questions to determine how much the licensing will cost. 1) Above, you can see the options: I chose branded content. It seems the only reasonable option. 2) I chose "INTERNALLY", because that is what I understand. If this will need to be on Youtube, please let me know. That will change the pricing estimated. 3) I noticed on LinkedIn - 655 employees. Can you verify that number? Music licensing will require a total employee count - including all departments and silos. 4) Non-Paid seems correct, but let me know if this will ever be used in another way - if so, we will just adjust the license at that time.